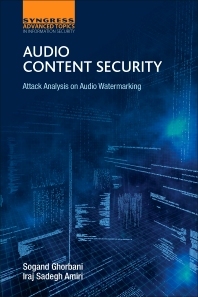 Audio Content Security: Attack Analysis on Audio Watermarking describes research using a common audio watermarking method for four different genres of music, also providing the results of many test attacks to determine the robustness of the watermarking in the face of those attacks. The results of this study can be used for further studies and to establish the need to have a particular way of audio watermarking for each particular group of songs, each with different characteristics. An additional aspect of this study tests and analyzes two parameters of audio host file and watermark on a specific evaluation method (PSNR) for audio watermarking. Sogand Ghorbani received her B. Sc. (software engineering) from University of Basir Abik, Iran, and her M. Sc. in Information Security from University Teknologi Malaysia (UTM). She currently conducts research in telecommunications and computer science. Dr. Iraj Sadegh Amiri received his B. Sc (Applied Physics) from Public University of Urmia, Iran in 2001 and a gold medalist M. Sc. in optics from University Technology Malaysia (UTM), in 2009. He was awarded a PhD degree in photonics in Jan 2014. He has published well over 350 academic publications since the 2012s in optical soliton communications, laser physics, photonics, optics and nanotechnology engineering. Currently he is a senior lecturer in University of Malaysia (UM), Kuala Lumpur, Malaysia.